“You might have noticed that this campus is very Harry Potter-esque,” said our tour guide as we started on the tour, and it’s true. There are lots of large, impressive, stone buildings. One of the things the college is proud of is their annual Harry Potter Festival (complete with Quidditch tournaments) to which the community is invited. This is a Catholic institution affiliated with the Sisters of Saint Joseph. About 50% of the students self-identify as Catholic; surprisingly, there are also lots of Buddhists on campus. Masses are held Monday to Friday morning and Sunday PM in the small chapel within the main building. Mass is never required, but students do need to take World Religions. This was the tour guide’s biggest class with 28. She also took a class called Spiritual Life Journey which was one of her favorites: rather than talking about a particular religion, it talked about spirituality and each person’s personal path. There are only about 950 traditional undergrads, 60% of whom live on campus. Housing is guaranteed for full-time students, and the dorms have the most amazing lounges I’ve seen! Apartments are reserved for students with a 3.5 GPA. They have to write an essay as part of the application to live there. Dorms are single-gender by floor except for suites. Freshmen are required to take an orientation class during their first semester where they meet with a mentor professor and have to participate in a certain number of events such as lectures, attending a club fair, participating in a dorm event, etc. They get their “passports” stamped to show they attended. It’s designed to ensure that they are acculturating to campus and getting involved. 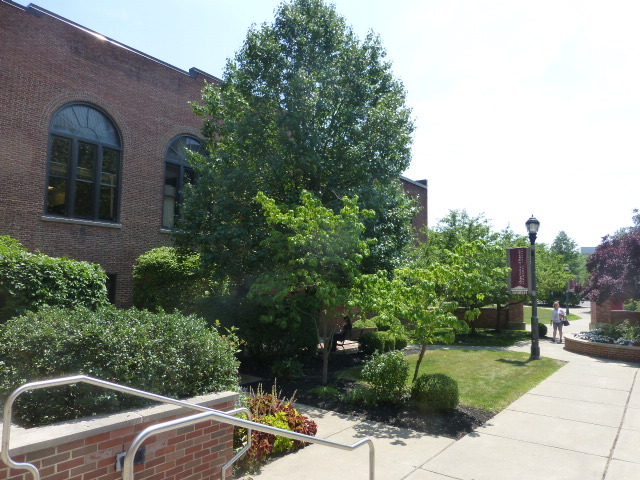 CHC sits on the city limits (the “Welcome to Philly” sign is right outside campus) and is 20 minutes from downtown. The train station down the street takes students to City Center. The school’s Sugarloaf Campus is a mile from Main campus, and shuttles run every 20 minutes. The old hotel (originally owned by Temple and sold to CH) is now a dorm. The Mansion, now used for events, used to be a Speakeasy. In addition to offering the standard fare of majors, CHC offers some specialty majors like Social Gerontology, Jazz Studies, Forensic Bio, Forensic Chemistry, and biology with a Sports Med Concentration. Certificate Programs include Intercultural Foundations, International Studies, Montessori Specialization, Religious Studies, and Digital Forensics. 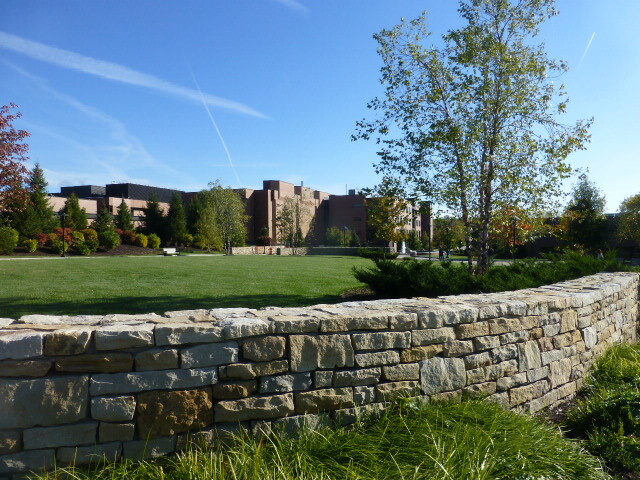 CHU also runs Dual Degree programs with 2 local schools, Thomas Jefferson (Radiological Sciences or Bioscience Technologies) and Arcadia University (Physician’s Assistant Program). In addition to departmental honors, they run an Interdisciplinary Honors Program which allows students to take a different approach to how they approach their work. Departmental Honors can be obtained by invitation after 2 years (60 credits) with at least a 3.6. Their athletics are DII, which is amazing for a school this size. Baseball, basketball, softball, and lacrosse draw big fan bases. They just added a Sprint Football Team for men (bowling for women to balance it out – not nearly as exciting! The tour guide said she pushed for field hockey but it didn’t happen). There are only 8 schools (including West Point, Navy, and Penn) in the country with this sport. They played – and WON – against Princeton! This is also one of the only colleges with a direct connection to the UN. The send a group every year to address committees at the UN Headquarters in New York. The two Heads of the UN Club this year are African. They draw a lot of international students, both as degree-seeking undergraduates and exchange students. They have a direct exchange “bed to bed/give one, get one” program. Many of these students come from South America and Europe. I came away from my RIT visit well-informed and so impressed that I was already texting pictures of relevant departments to faculty at school and emailing students telling them to check things out. The campus is more attractive than expected (one of several nice surprises! 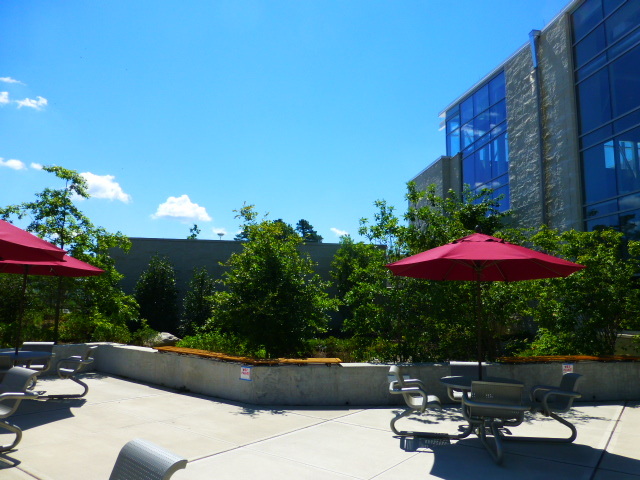 ); while a few buildings have a tech-school feel, most of campus has new buildings, trees, and green spaces. Quarter-Mile is the main thoroughfare, but it’s actually one-third mile long; its name came from a Greek fundraiser where people put quarters end-to-end to raise money. 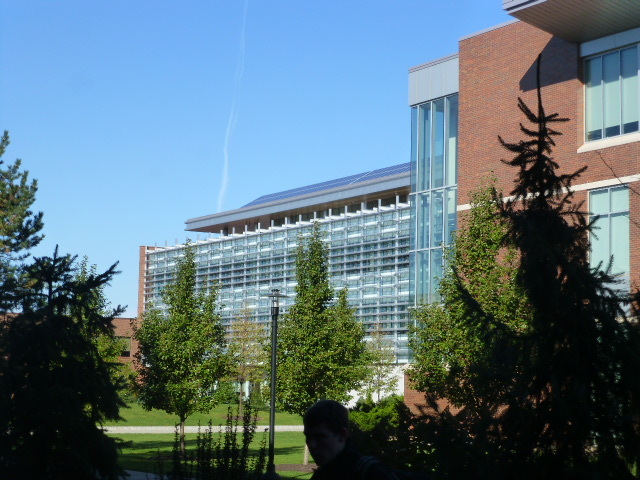 A large portion of campus is undeveloped giving Environmental Studies and other students an opportunity to complete surveys and other work on campus. With 15,500 undergraduates, this is one of the largest private universities and one of the largest producers of STEAM (add Arts to STEM) graduates from private institutions. Students come from all 50 states (48% from NY); the 2,500 international students hail from 100 countries; there are 1,200 deaf and HH students on campus through NTID; and almost 2,900 underrepresented minority students. 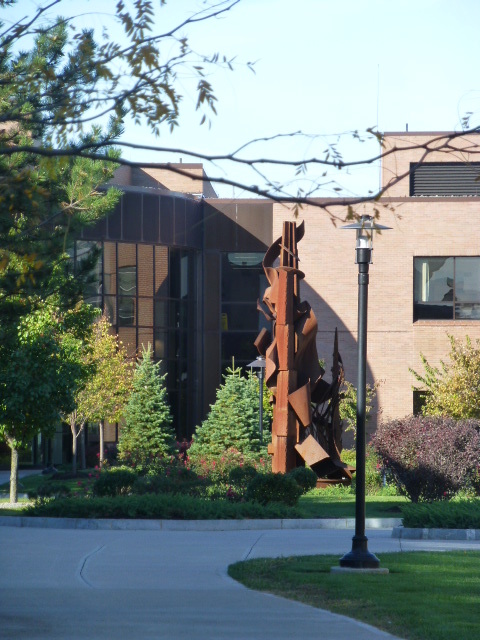 “RIT is diverse with people coming from all over. They’re friendly, welcoming, and don’t judge,” said one student panelist. 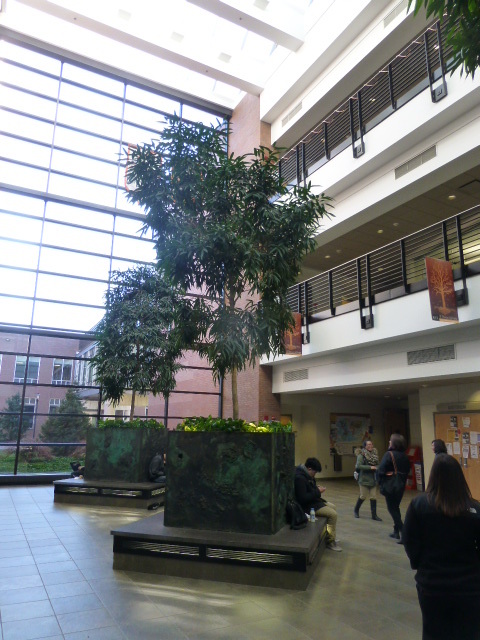 A fountain in the Student Center which had been the gym. These bleachers had been built into the foundation and weren’t able to be moved so they made a fountain. This is a spirited community. Students were everywhere and engaging with people around them: walking in groups, studying or socializing in every building we went into, etc. These are not “stick-your-nose-into-a book tech nerds,” said one student. 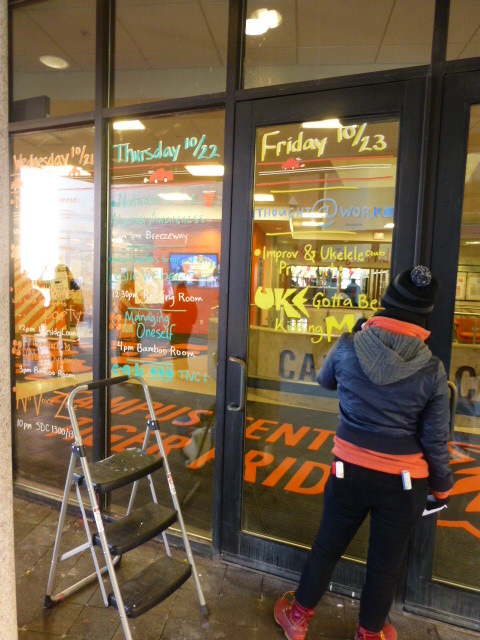 There’s a ton to do on- and off-campus including 1,300 annual on-campus events including free movies on Thursdays, Brick City Weekend, FreezeFest, SpringFest, Imagine RIT, Orange and Brown Fridays, student concerts/theater productions, sports, and performers (Macklemore, Michael J. Fox, Jon Stewart, John Oliver, Al Pacino, Maroon 5, and MythBusters, to name a few). Greek life hosts lots of events. Hockey (they have a new arena) is big with lots of traditions. Students look forward to the annual Haunted Trail (they turn the fields and woods into a giant haunted house and invite the public) and the Humans vs. Zombies game (campus-wide nerf-gun tag). RIT practices differential Admissions: students must declare a major and list first, second, and third choices on their application; on average, 57% of applicants are accepted, but this varies by program. For example, it’s far more difficult to get into Mechanical than Industrial Engineering. (Biomedical, Computer Science, Game Design, and PA programs round out the 5 most difficult majors to get into). The Deans give numbers to the admissions staff based on space. However, students aren’t stuck in that major: it’s easy to switch majors “95% of the time,” said an admissions rep. Much of it depends if there are spots available in the new major. Students interested in areas that cross 2 or more colleges should apply for University Studies. They accept about 100 students a year into this program. Students may not graduate on time (but could) depending on how soon they decide. Do an Undeclared/Exploration major in any of the schools. There’s no problem graduating on time because they’re taking the first-year classes right away. Students studying in the science lobby. Check out the floor and walls! The high school record (GPA, rank, rigor, pre-reqs, grades in content courses) makes up about 60% of the admissions decision. Portfolios (if required) are sent to that school’s faculty and get ranked 1-6. If the portfolio doesn’t make the cut, Admissions will work with the applicant to suggest a similar area without a portfolio requirement. Students complete 6,100 co-op education assignments each year with 2,100 employers in 50 states and 40 countries. Students generally complete 4 placements over 2 semesters and 2 summers. They can’t go back to the same company unless it’s in a different division doing completely different work. Students collectively earn $26 million annually. Princeton Review has consistently ranked them in the Top 10 for career services. 60% get employed by one of their co-op placement companies. Graduates report a 95% placement rate: 85% in FT jobs, 10% in grad programs. The Center for Media Arts, Games, Interaction, and Creativity studio helps students launch their own companies with high-tech facilities needed to commercialize computer gaming, film and animation, graphic design, and imaging science projects. Rochester has lots of cottage industries, fiber-optics, high-tech companies, medical technology, pharmaceutical firms, etc. There’s no shortage of internship opportunities. Students get creative when internships are difficult to find. A Photo student on the panel said that “It’s hard to get internships in photography; they aren’t looking for interns.” She was paired up with a 3rd year student; they did all the photography for a department on campus. Despite the size, most classes are not in lecture halls: 88% of classes have fewer than 40 students so classes tend to be discussion-based. GAs and TAs help in labs but never teach classes. They’ve recently opened more student housing including the RIT Inn (an old Marriott) and the newly built Global Village housing 400 sophomores in suites. “They had been getting lost in the shuffle: we have traditional dorms for freshmen and apartments for upperclassmen.” School-owned apartments are ½ a mile down the road with shuttles running to campus. 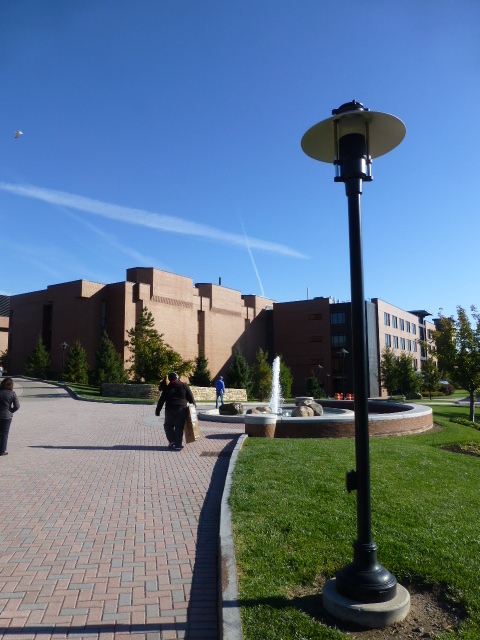 One complex only houses RIT students; the other gives first crack to students, then opens it to others. Greek housing, Special Interest Houses, and Academic and Lifestyle Floors are also available. Tunnels connect most of the on-campus dorms. Students had few complaints except that parking is difficult. Preferred/reserved parking costs $225 a year (General parking is $50). It’s not unusual to drive around for 10 minutes looking for a spot and then walking a ways to get where they’re going. Cars aren’t necessary except for some internships. Buses running through town are free to students on weekdays and $1 on weekends. 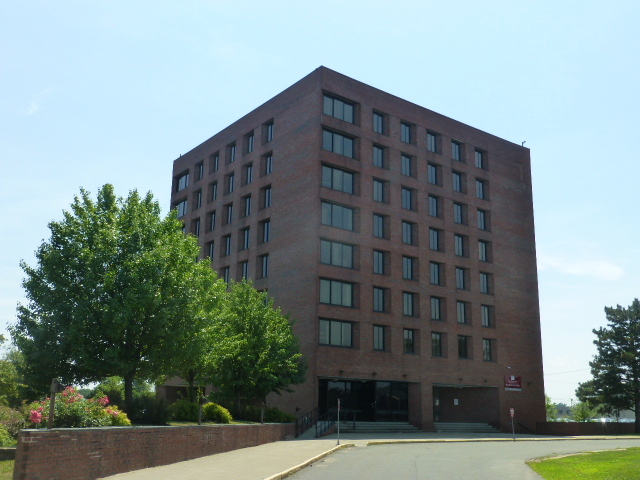 Centrally located amongst hospitals, Albany Law, and Sage College, this unassuming main building on the main street opens onto an attractive campus behind it which is much larger than it appears at first glance. Obviously, this is a specialized school. They know who they are, and they do it very well. 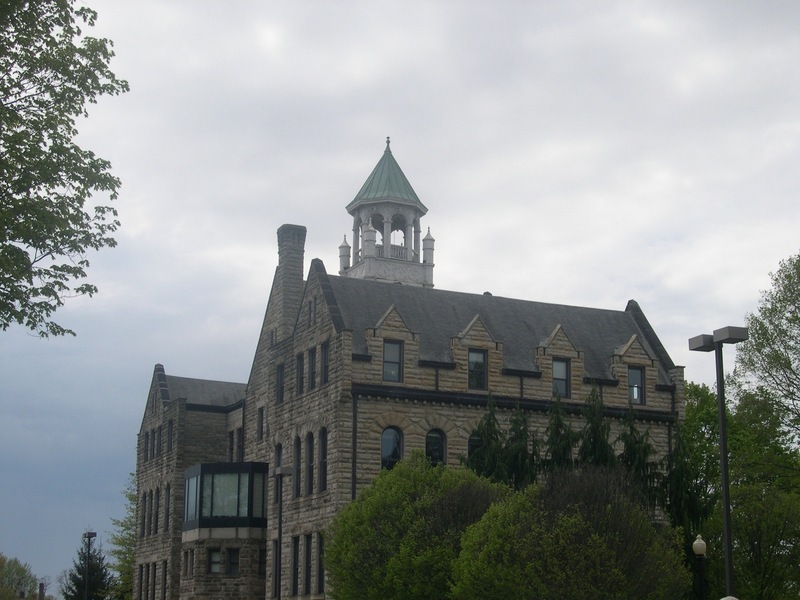 They offer 6 Bachelor of Science programs: Biomed Tech, Chemistry, Clinical Lab Sciences, Health and Human Sciences, Microbiology, and Pharmaceutical Sciences. They offer a PharmD program. This is accelerated and is one of the few Doctoral level schools that admits international students. Graduates can get licensed in many states, and international students can do a 1-year optional practical training program on their visas. This program is not accelerated; students still do 4+4 years, but the MCAT requirement is waived. Students must be US citizens for this program. “We’re about getting you to the end goal,” said the admissions rep. The school provides the tools to help students do that. Students who do well here are fairly organized, type-A, focused, less Liberal Arts type of kid. Those who transfer out are split between those who change their majors and those who are not committed to the rigor. 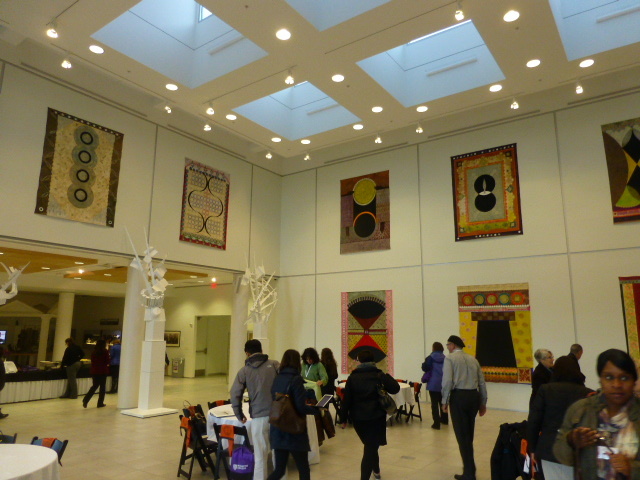 They like the community of a liberal arts school in a building crossed with specific goals. Applicants tend to be fairly self-selecting, but they’re still a selective in admissions process, looking to bring in about 250 first-time freshmen each year. They are Common App exclusive and will superscore the SAT. They look for recs from a counselor and either a math or science teacher. International students must turn in the TOEFL unless English was the language of instruction for 4 years. For scholarships, the look at math, science, and composite scores. 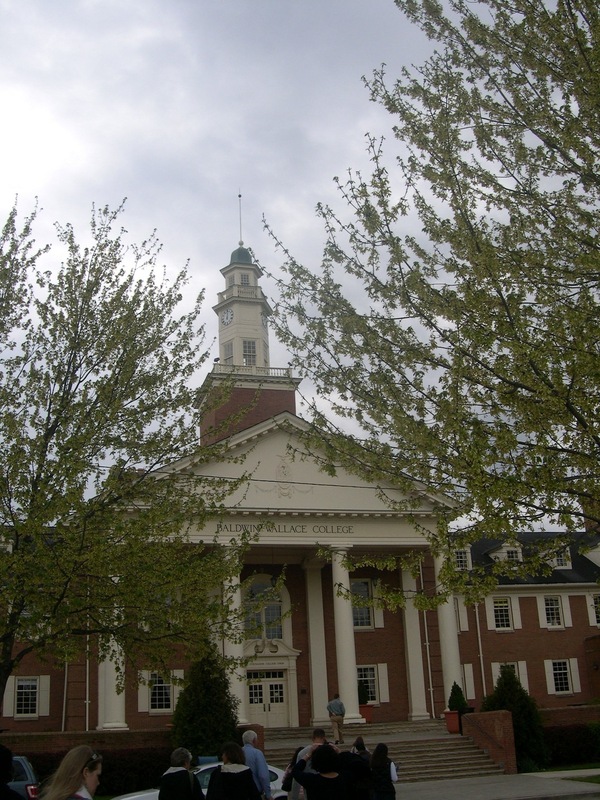 Students must live in campus housing for 2 years, and upperclassmen who want housing can get it; usually seniors are off campus completing credit-bearing internships, so space is rarely an issue. They have room for 900 of the total 1300 undergraduates. Housing is spit by 1st year, 2nd year, and 3rd+ years. The tour guide really liked this system: “There are always people in the dorm taking the same classes, so when we’re stuck on something, there’s always someone to help.” The freshmen dorms were getting work done, so I saw a sophomore dorm. We went into a 7-person suite (1 double, 5 singles) that had a bath and common room. Even the freshmen dorms have bathrooms in the rooms! 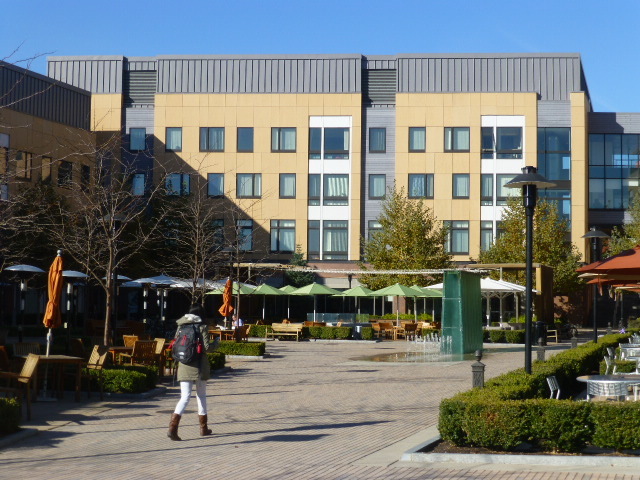 Campus Suites is a privately-owned apartment complex on the edge of campus. Students from all the area colleges can live here: the tour guide had people on her floor from Sage and Albany Law which she said was really cool. Students can have cars; parking is assigned by lot, but not by specific spots. The guide said she never had problems with parking. Students can do some internships abroad. One requirement is a community health stint. They can do 3 weeks in Cambodia, Haiti, and others; usually they can choose from 8-10 international sites each year. I don’t get the sense that there’s a ton of activities going on around campus. They only have 4 DIII sports and a few club sports. The gym is under the library and is shared by Albany law. There are a couple coed professional fraternities. Although much of their coursework is geared specifically around their professional work, students have to take a 3-course history sequence and a communications course. Students can participate in the Hudson-Mohawk cross registration program and can take 1 class each semester off campus. It shows up on their ACPHS transcript as if they took it on campus. For example, they can do dance classes at Sage or languages at SUNY.